A Chinese company has released a computer about the size of an SD card that can run a full version of Android and should make it easier to build wearable devices. Called the Newton, the computer was developed by China's Ingenic Semiconductor and is the first development kit for wearables with a MIPS-based CPU. It's an integrated board, like a smaller version of the Raspberry Pi, aimed at those who want to build and prototype wearable devices. Such hardware development kits are becoming popular, and Intel has also released a miniature computer for wearables, called Edison. Newton can include a CPU, Flash, Wi-Fi, NFC and various sensors on a single board about the same length as two U.S. quarters, or two euro coins. The Newton appears to be available now, though it wasn't clear from the company's website how much it costs or where it can be ordered. Ingenic's chips aren't new to wearables market -- they're already used in inexpensive smartwatches, said Alexandru Voica, a spokesman for Imagination Technologies, which develops the MIPS architecture. 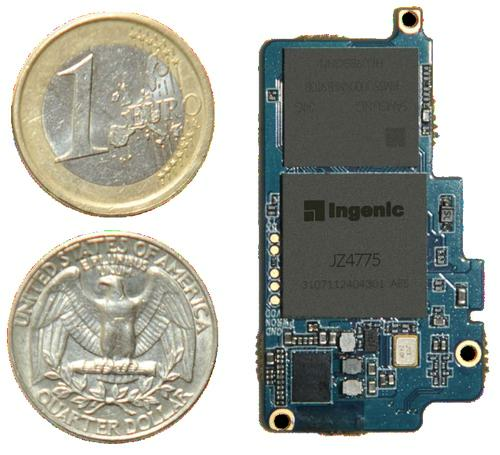 An Ingenic MIPS chip was also used in US$99 Android tablets that hit the market a few years ago. Intel's Edison was originally the size of an SD card but it has been made a bit bigger to incorporate more sensors. Along with wearables, the development kits from Intel are also designed for use in sensor equipment and data-gathering instruments. There are trade-offs with the small size, which limits what the boards can be used for. Freescale has a larger board for building prototypes, called Warp, that includes wireless charging and supports a wider array of sensors. The Newton board isn't yet compatible with Android Wear, but that may happen eventually. "Android Wear is still in development so we can't claim full compatibility yet," Imagination's Voica said. "We are, however, the only CPU IP supplier on the list of Google ecosystem partners, so the MIPS architecture is fully covered." Intel also plans to make chips compatible with Android Wear, but unlike Imagination Intel doesn't widely license its core CPU designs, meaning chip makers like Ingenic can't make x86 processors. Low power consumption is key to the long battery life wearables need to provide. Newton consumes 4 milliwatts in standby mode and consumes 100 miliwatts during MP3 playback, Imagination said in a blog entry about the board Tuesday. "This means that Ingenic-powered smartwatches can last for 30+ hours on a single charge," Imagination said. The Newton's MIPS CPU operates at 1GHz and the graphics core can play 720p graphics at 30 frames per second. Other features include 256KB of L2 cache, Wi-Fi and Bluetooth attachments, and UART, USB and GPIO connectors. And the board can support up to 3GB of memory.